The flow chart for Map 1 starts with two un-numbered boxes. First, it indicates the assumption that you are here because a patient has complained of being depressed, or appears depressed without saying so. The boxes are not numbered because at this time they seem relatively self-evident.Other boxes on this map are numbered, to indicate the presence of corresponding sections of text that further explain what they mean and how they can be interpreted. For each of the numbered boxes, a link to the text appears on this page. If a person seems depressed, it is important both to gather some basic information [Section 1] and to work on your relationship with the patient [Section 8]. Depressed people often need more support and understanding than others, and there may be special dangers that their despair can affect their judgment or their will to live.. The flow chart shows work on the treatment alliance as beginning early and continuing throughout, and parallel to, other aspects of treatment. However, when people say they are depressed, a variety of things may be happening, and further diagnostic work is needed in order to begin the work. This is discussed in Section 2, where an initial attempt is made to separate depression from grief, reactive sadness and an adjustment reaction. More on reactive sadness, adjustment reactions and grief can be found in Section 23. 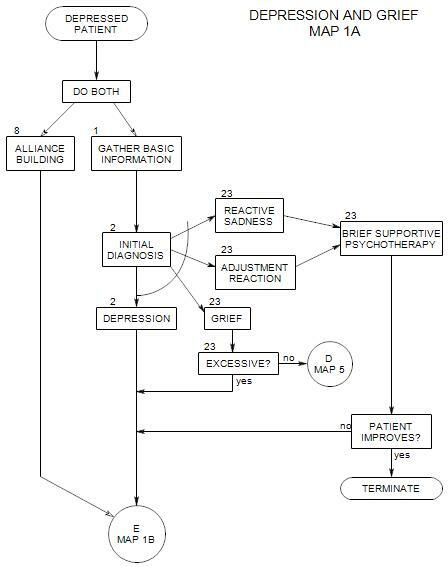 Basic information gathering [Section 1] is placed early on the flow chart, but you will need to gather information throughout therapy, as you refine your understanding of the patient and he/she changes. Gathering and providing information is also part of alliance-building. Next you are referred on to the top of Map 1B, where the search for the origins of the patient’s depression will begin.